President Trump donated his first quarter salary to the National Park Service, following through on yet another campaign promise. White House Press Secretary Sean Spicer announced that the President was donating his full paycheck of $78,333.32 to the Park Service. President Donald Trump is donating the $78,333.32 salary he has earned so far to the National Park Service. “It’s straight up. Every penny that the president received from the first quarter,” Press Secretary Sean Spicer told journalists at a White House press briefing Monday. Spicer handed a check to Interior Secretary Ryan Zinke and Tyrone Brandyburg, the superintendent of Harper’s Ferry historical site. “The president is personally proud to contribute the first quarter of his salary to the important mission of the Park Service, which is preserving our country’s national security,” Spicer said. 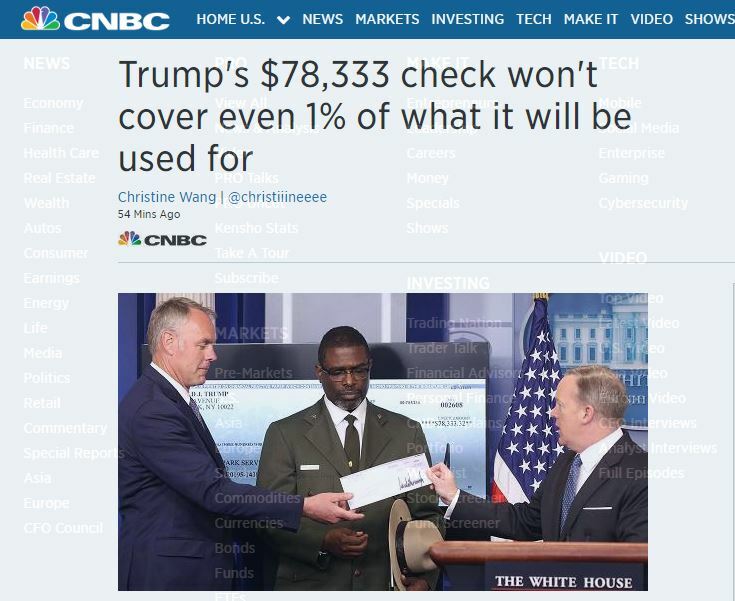 Zinke posted an image of the payment on social media and thanked Trump. The gesture has to be super-confusing for our friends on the left, who portrayed Trump as being anti-Park Service following an incident in which they tweeted side-by-side photos of his inauguration with that of former President Barack Obama. Still, that’s not about to stop them from finding a way to complain about a positive gesture from Trump because he can do no right in their eyes. This self-described digital organizer for Hillary Clinton complained that Trump’s donation would be tax deductible, and thus he would only have donated the money just to make some cash on the other end. Had Barack Obama or Hillary Clinton donated such a large sum of money to the National Park Service, they’d be canonized immediately as being patron saints by the Left. Support President Trump’s gift to the National Park Service? Like and share this post!